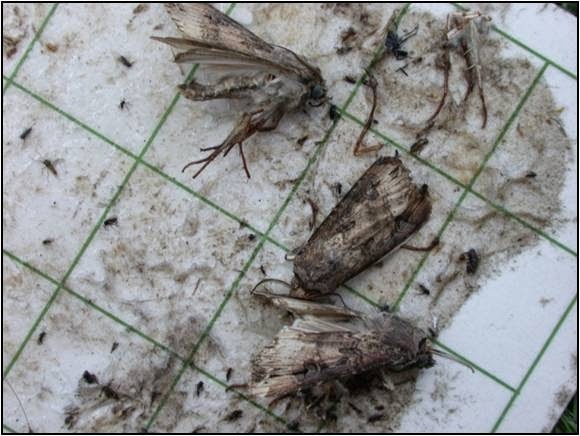 Picture of black cutworm moths stuck to a sticky card taken from a trap via Kelly Estes. Based upon captures of moths in pheromone traps (like the one above), projected cutting dates are offered. 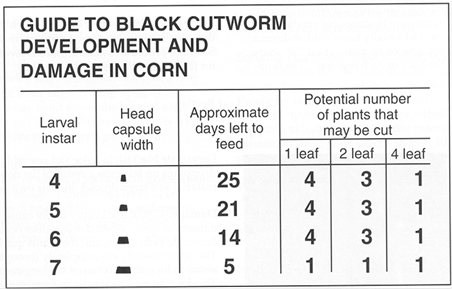 Pest Alert: Significant Black Cutworm flight in Christian County. Projected potential cutting date: May 13. Pest Alert: Significant Black Cutworm flight in Piatt and Woodford County. Projected potential cutting date: May 14. Pest Alert: Significant Black Cutworm flight in McDonough and Brown County. Projected potential cutting date: May 17/18. The projected date is when potential injury could occur via cutworm. This was provided by Kelly Estes. If you have a Black Cutworm trap or if you have seen moths in your "neck of the woods" in Illinois, you can make your own prediction of projected cutting dates by using the Illinois State Water Survey - Daily Pest Degree-Day Calendar. The prediction of projected cutting dates is based off the capture of 8 or more moths over two days. 1.) Seed treatment: PowerShield® on Burrus corn hybrids consists of an insecticide, multiple fungicides, nematicide, and biologicals. The higher rate of Poncho® or Cruiser® insecticide in our corn seed treatment ensures greater systemic protection against early insects, such as black cutworm. For more information, refer to the Burrus Seed Treatments. 2.) Transgenic Corn Bt traits: Most of Burrus Bt traited corn hybrids ending with (AMXT, AMX, AM, AMT, 3111, 3220, 3122, Q) control back cutworm. Refer to the Handy Bt Trait Table published by Drs. Chris DiFonzo (Michigan State University) and Eileen Cullen (University of Wisconsin) to determine if a Bt hybrid offers black cutworm protection. 3.) SCOUT! Cutworm larvae will be found curled up just beneath the soil surface near clipped plants. Scouting requires weekly field visits. Five plants should be examined in each of 20 locations scattered throughout a field. If clipping reduces stand by 3% and larvae are still present, University entomologists recommend a rescue application of insecticide. "Dr. Eileen Cullen, University of Wisconsin Extension Entomologist, takes you into the field to show you when to scout and how to manage key pests of Wisconsin field crops"